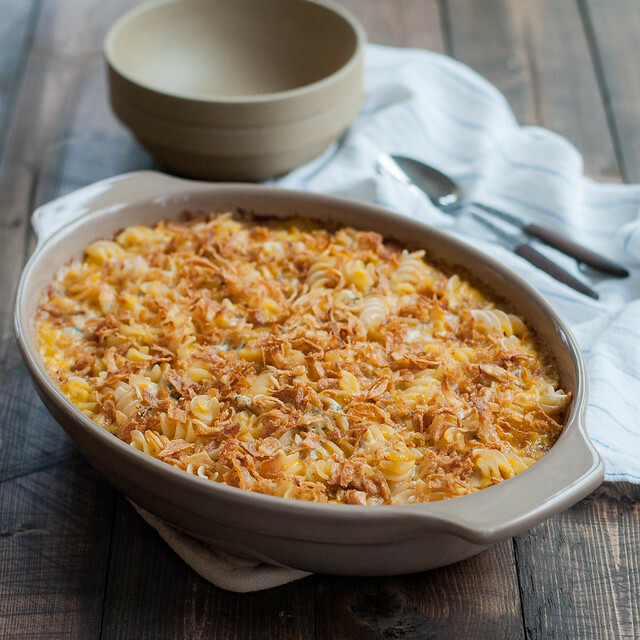 It’s a new year, and I’m doing you the disservice of starting things out with another mac and cheese recipe. That’s because, around here, I’m not about deprivation and diets. What good am I to you in tackling your resolutions, then? If you come back next week (and throughout the year), you’ll notice the theme at NCK of balanced healthy eating. I love kale as much as the next healthy food blogger, but I also love potatoes and cheese and pizza and pasta. Sometimes I indulge fully, calling up the Papa to do the cooking, but more often, I spin my old and new favorites into healthier adaptations without gluten or meat, with less dairy, and packed with more vegetables. 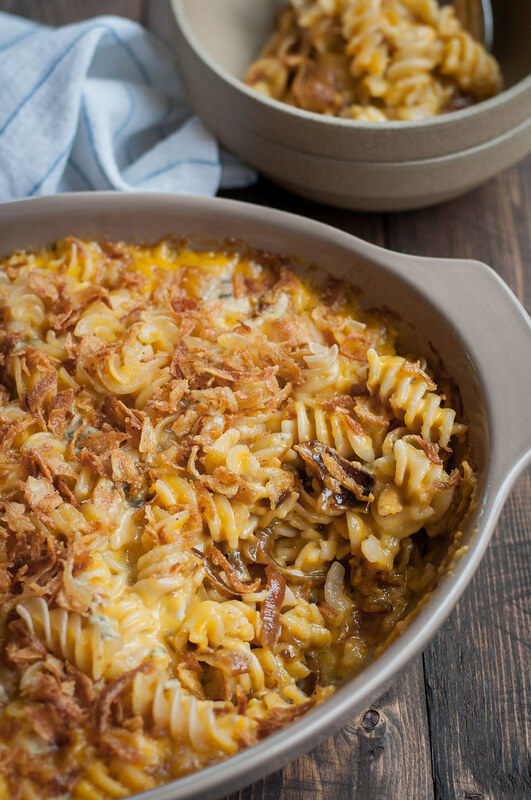 Caramelized onion mac and cheese is no exception to my usual process. It began not as a potential blog recipe, but as a means to use up butternut squash soup leftovers in the freezer, some cheese block stubs, and a half bag of gluten free pasta in the pantry. I was just playing in the kitchen, trying to merge four ingredient gluten free mac with butternut squash mac. The flavors and textures sounded perfect together: sweet from the butternut squash soup and the caramelized onions, salty from the cheddar, bold and pungent from the blue cheese, and crunchy from the optional-but-highly-encouraged packaged fried onions, also left behind from Thanksgiving. It’s a pure miracle I didn’t consume the whole cannister like chips on Black Friday, but that’s a confession for another day. It’s been a whole year since my first meatless month experiment. I don’t label myself a vegetarian, but I haven’t looked back much, save for difficult restaurant menus or pulled pork made for a crowd of omnivores. Every time I do take a bite of meat, it’s less satisfying than the last one, so it only makes sense to keep on this path of focusing my diet and recipes on plants. 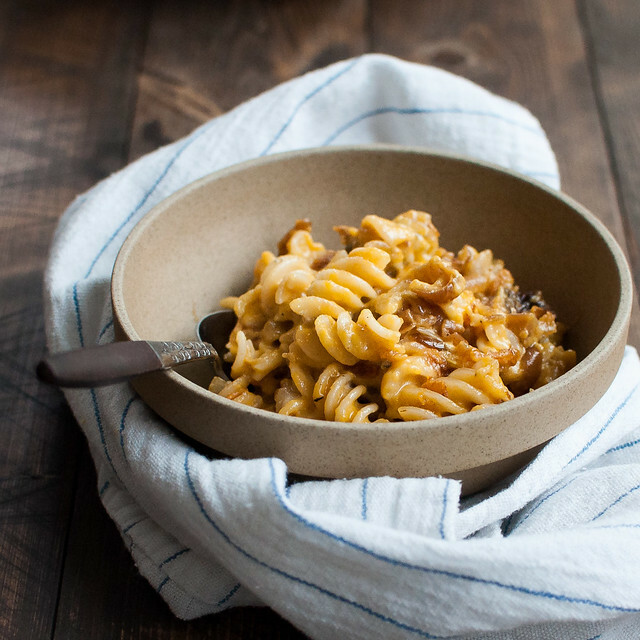 What makes today’s caramelized onion mac and cheese recipe even more ironic is my unofficial resolution to cut back on dairy. I haven’t set any strict rules or timelines, but I don’t feel set up for failure. Even in the last couple days, every time I open the fridge, it challenges me, in a stimulating, not deprived, way, to substitute avocado for sour cream or just skip the cheese in the salad I’m making for a dinner party tonight. At lunch yesterday, I had all the makings of some killer microwave nachos in the house, but I was so satisfied and happy with the brown rice, white wine braised kale, and avocado bowl that I chose instead. Indulging on occasion helps to keep me satisfied with more plant based food choices. Don’t be fooled; the main course at tonight’s aforementioned dinner party is baked ziti (Smitten Kitchen’s recipe–her site happens to be down right now). Gluten free pasta (hopefully my guests aren’t reading this), red wine sauce packed with mushrooms and greens, annnnddddd about four kinds of cheese. On new year’s eve, I whipped up the richest pimento cheese, my first attempt at the dish, and it leaves me wondering why I would ever bother with a cheese platter again, when I can slather this thick, spicy dip on crackers and veggies without the awkward moment of, “so, who’s going to cut into that beautiful block of gouda first?” The ethical and environmental picture of meat and dairy production demonstrates that vegan clearly is the best diet choice, given my views, but I’m the type who’s never quick to jump on the bandwagon. I’m wrestling with the issues and my diet is seeing gradual change as a result. If you like what you see (and cook), you may want to subscribe for weekly updates. The email goes out once a week, not automatically every time I post, so it won’t gunk up your inbox when you’re trying to keep things tidy in the new year. Every week I send out a short, personalized message highlighting new recipes, seasonal and holiday ideas, and a peek into what’s happening behind the scenes at NCK. Kind of a little extra story to go with the recipes. And, of course, some pictures to help motivate you to get into your own kitchen. As a bonus, you get my free eCookbook when you subscribe. It features a week (four nights) of healthy, stovetop dinners like seared eggplant with homemade tzatziki and huevos rancheros. Best of all, it includes a complete electronic (or printable) shopping list. So if you’re scrambling to get it together for the first week of 2016, I hope to help. One little problem with food blogging, even if I’m working on super healthy recipes, is that I tend to snack all damn day. I have to taste the food, right? Maybe Giada would disagree, but I find it necessary. Standing around the kitchen doesn’t burn as many calories as one might think, and running doesn’t always jive with my bones anymore. Enter Yoga with Adriene. This is not a paid plug, but after more than a year of following her YouTube channel, seeing it grow explosively, and establishing a consistent yoga practice for the first time in my life, I’m way less stressed, in better shape than I thought was possible from jumping around on a mat, and I CAN DO A HEADSTAND! So of course, I’m itching to tell everyone who will listen how you don’t have to have an expensive yoga wardrobe or be flexible or spend your life savings on public classes. My entire family–Mom, Dad, sisters–have gotten in on the party, along with a few friends. Steve rolls his eyes at Adriene’s mannerisms and sometimes dirty jokes, but he’s even done a couple videos with me. Like NCK and so many food bloggers, she offers almost all her resources for free on YouTube, and if you’re the tiniest bit curious about a laid back yogi, hop on over and join her virtual 30-day yoga camp (for free, of course). Happy new year! Let’s make it an exciting one. P.S. You might be wondering why I’m not bragging incessantly like a proud parent about my new pup. For the days when I forget to write about him, go see his Instagram account–the pictures do him so much more justice. Use leftover or store bought butternut squash soup; don’t make it fresh just for this recipe. 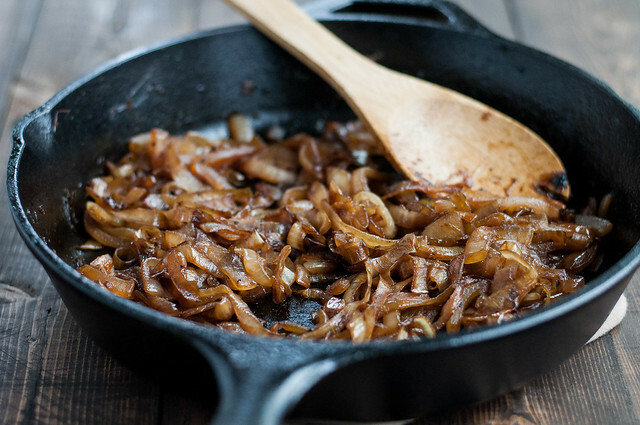 Make the caramelized onions ahead of time and freeze or refrigerate them. They lend themselves well to a double batch (just make sure to use a larger pan). 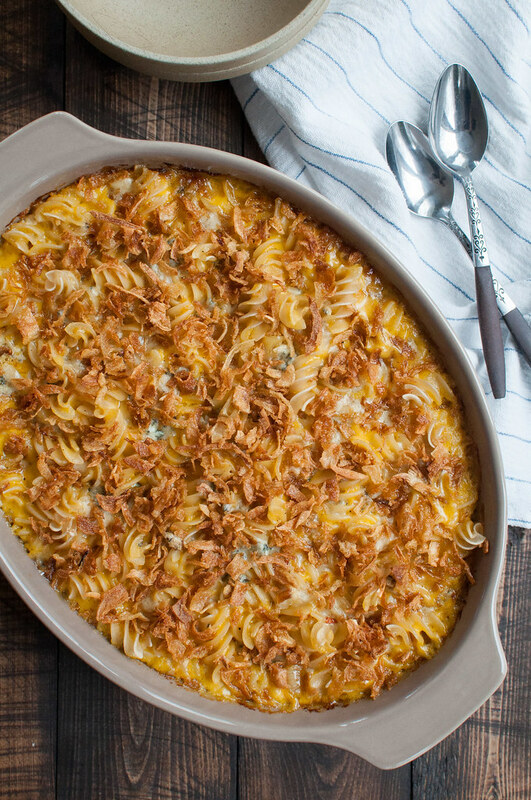 Assemble the mac and cheese and refrigerate up to a day before baking. Bake the entire dish ahead of time. It freezes well, especially in individual portions to take for lunch. In the absence of a roux (flour and butter thickener), an egg yolk makes the cheese sauce extra lush and silky. 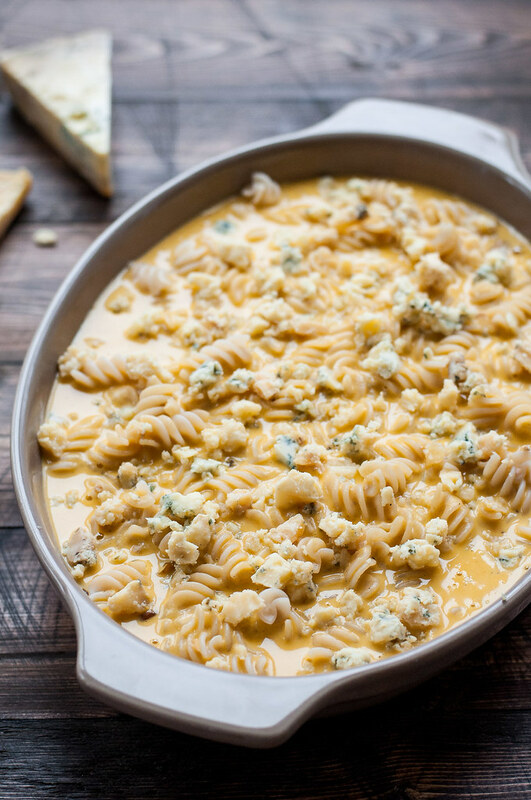 It acts kind of like the gross-but-delicious Velveeta mac, without weird ingredients. The yolk cooks fully in the hot cheese sauce then in the oven as the mac and cheese bakes, so no need to worry about consuming raw eggs if you follow the recipe instructions. For egg allergies, leaving it out should work, but I have not tested it that way. 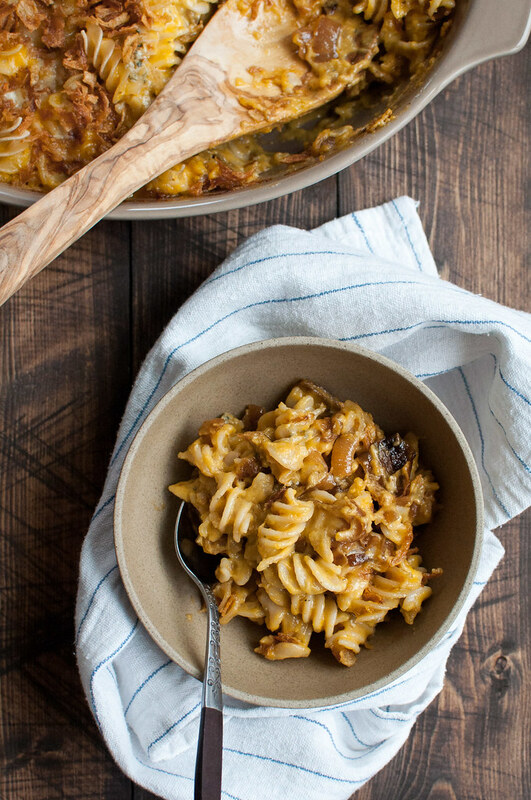 A mac and cheese recipe inspired by leftover butternut squash soup and a craving for lots of big, contrasting flavors. The soup makes this recipe not only a little better for you than standard mac and cheese, but also quick to prepare and rich enough than you can skip the roux (and the gluten). Halve the onions lengthwise and slice ¼" thick crosswise (half rings). Have all other ingredients ready. Heat oil and butter in a 10" cast iron or nonstick skillet over medium high. After butter has stopped foaming, add salt and agave and stir to combine. Immediately add onions and toss to coat. Cook about 5 minutes, stirring occasionally, until softened. Reduce heat to medium low and stir often for about 40 minutes, or until onions are deep brown and a bit sticky (they won't be jam-like, as in many caramelized onion recipes). Decrease heat if you notice onions are burning or increase heat if they're barely browning halfway through the cook time. Off heat, stir in water and season with black pepper to taste. Bring a pot of water to boil then add a generous sprinkle of salt. Add noodles and boil for 5½ minutes, stirring every minute or two, then drain and rinse with cold water. The noodles will be slightly undercooked but will soften as they bake. Preheat oven to 375 (F). Bring soup, cream, and paprika (if using) just to a boil over medium high, simmer for a couple minutes, then whisk in cheeses. Sauce will be thin. Whisk egg yolk in a small bowl while slowly adding about ½ cup of the cheese/soup mixture. Whisk yolk mixture back into the cheese sauce. Season to taste with salt and pepper. Spread half of cooked noodles in a buttered 2 qt. baking dish. Top with caramelized onions and remaining noodles. Pour sauce over and shake pan gently to help it settle. Top with blue cheese on middle rack for 15 to 20 minutes, until bubbly. Sprinkle fried onions over the top and bake another 5 minutes, watching that onions don't burn. Caramelized onions recipe adapted from Cooks' Illustrated. 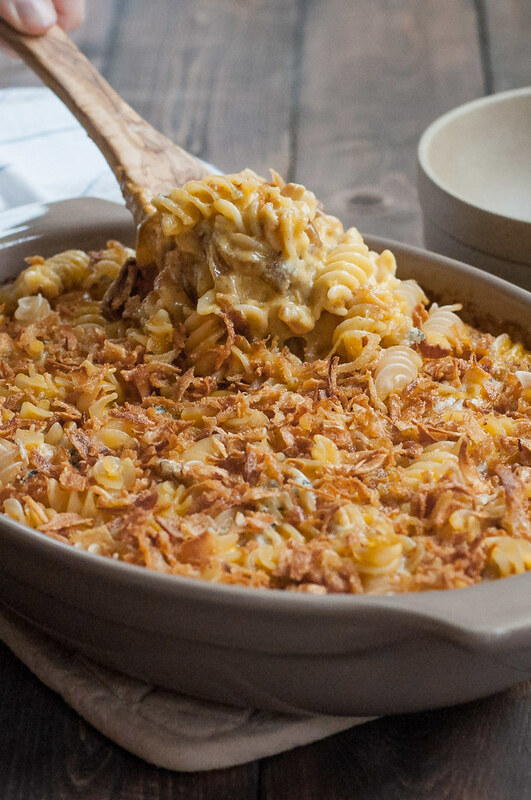 Except assembly, the mac and cheese can be otherwise prepared while the onions caramelize. You'll have time in between steps to stir the onions. 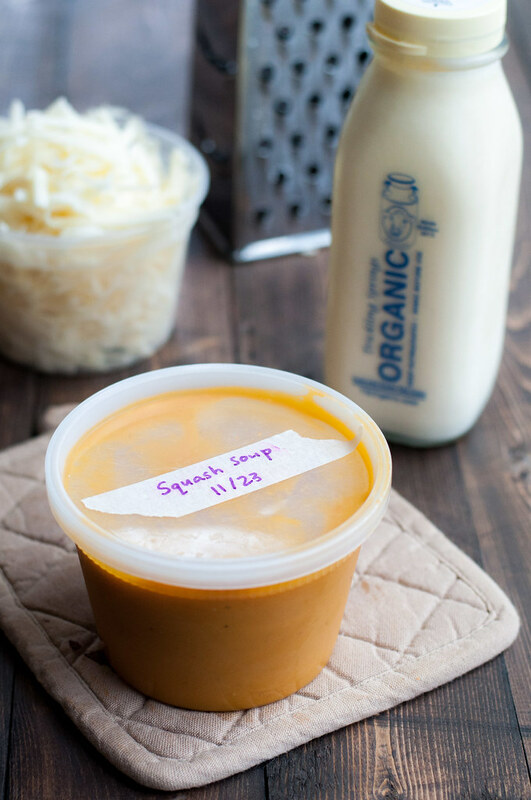 Homemade or store bought butternut squash soup will both work. Check the ingredients to make sure it conforms to any dietary restrictions, and that it uses simple ingredients (I used leftovers from this year's Thanksgiving). If the soup is very thick, add water or vegetable stock to reach a just pourable consistency.